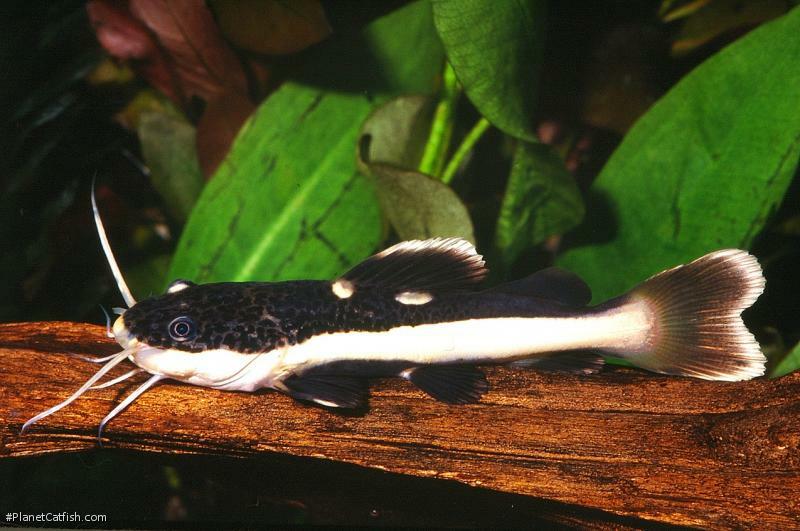 With the exception of the Zebra Pleco (Hypancistrus zebra), South Americas Red Tail Catfish must surely be the most written about single species of catfish. There are books, clubs and even a CD-ROM devoted to this one species. Strange for a fish whose husbandry is beyond all but the most serious, dedicated and responsible aquarist. What is the Red tails appeal? On the face of it: size matters. This fish is about the biggest commonly available fish that an aquarist could house. Status - we are talking about the fish commonly referred to as "the emperor of the Amazon". They have a beautiful colour pattern which, unusually, gets better with age and they have character to match. Once settled Red tails will react to their owners presence and can be taught to hand feed. As babies, or "kittens" as they are affectionately known, these fish are terribly cute and thus very saleable. They have exactly the same appeal as real kittens or puppies; and the same, if not more responsibility. To timely quote a keeper of this fish, "A red tail is for life, not just for Christmas". Here's a simple bit of economics to make you think: Wild caught fish are imported by air in boxes, with the exception of very rare or fragile species, the more fish in the box, the cheaper the fish. When they first appeared for sale, red tails were sold as larger sub-adults commanding a high-price. Today, red tails are imported in boxes of around 50 "kittens" usually smaller than 2". If you were to import, say foot long, juveniles you would only be able to fit two in the box and thus their sale price would have to be disproportionately higher than their size to make as much money as the box of "kittens". Further, take into account that the 2" specimens will reach a foot in length in about 6 months anyway; There is simply no commercial sense in importing larger fish. Thus it can be surmised that every red tail you see for sale larger than 2" in a shop is the product of someone careless enough to purchase a "kitten" only to have it grow beyond their ability to look after it. An adult red tail will require at least a 8 foot long tank which should be a minimum of 30" front to back (width) to allow the fish to turn properly. Although the fish are commonly found in deep water pools in the wild, they don't seem to require such a water depth in captivity and minimal substrate (undergravel filtration is not a good idea for these fish due to their ability to move large amounts of the filter area if they take the notion) means that even a tank 18" tall will suffice. Taller tanks will allow the fish to more clearly signal when they are hungry as they start "prowling" around the surface when their stomach rumbles and give you more room for manoeuvre with water changing regimes. Adult red tails only require feeding approximately weekly and even this is a luxury compared to their wild feeding habits. Rearing "kittens" is all too easy, they will eat all foods and grow to 12" or so in a "normal" sized aquarium, almost as you watch. A 48x18x18" aquarium is ideal for this purpose. But you must have larger accommodation ready, these fish need it. Often when moved to such aquaria or after too heavy a water change these fish shed their skin which can be seen floating around in large translucent lumps of mucus. At these times the fish may also stop eating and care should be taken not to over feed - it takes a long, long time for a healthy red tail to starve, so take it easy and let the fish adjust to the tank and the tanks filter adjust to its increased workload! So then, a fish for the dedicated aquarist, a lifetimes's challenge, but worthwhile in that your efforts are rewarded by a tame pet that will react with you and share 25 years or more of your life. If there is even the slightest doubt in your mind about that large aquarium to handle a 2 foot+ monster for that length of time, go buy a shoal of Pimelodus pictus and enjoy this family of fish at a more responsible level. Size 1100mm or 43.3" SL. Find near, nearer or same sized spp. Identification An unmistakable species - the only identification woes come when examining young hybrids which appear in the hobby from time to time. The amelanistic form (absence of pigmentation but no albino pink eyes) is only found in young fish and only lasts for a few weeks. The fish revert to their normal colouration thereafter. Sexing Unknown, although the tail colour (which varies between red and orange / pink) and darkness of the top of the head (which varies from black to grey with black spots) vary from fish to fish. These are more likely to be due to diet and mood than sexual differences. Distribution Throughout the Amazon system; Brazil, Guyana, Venezuela, Peru. Feeding The important fact in feeding these fish isn't what it's when. Red tails should only be fed sporadically. Once fed they become sluggish and so the time to feed a red tail can be gauged by the activity of the fish. It will become permanently active when hungry. Over-feeding can be disastrous and is a common cause of death in these fish. In the wild the fish eat fallen fruit, crustaceans and fish. Furniture The fish does not require cover although subdued lighting should be utilised. Aquarium decor and equipment should be selected and deployed for it's own care rather than that of the red-tail. Thus the required heavy external filtration and out-of-tank heating are recommended. Red tails are renowned for swallowing items within their tanks (I.E. heater clips, filter intakes etc. ); gladly these are often regurgitated but can sometimes cause serious problems for the fish. The best policy is to have as much as possible outside the aquarium. Compatibility This fish is territorial within confined spaces and is certainly capable of killing other tankmates. Best kept 'home alone' unless a very large aquarium is to be provided. Suggested Tankmates Given sufficient space (and we are talking small ponds here or public aquaria) the fish can be successfully mixed with other large Pimelodids, Doradids, Cichlids and Characins. Breeding One captive spawning report exists from American fishkeeper Richard DeLeonardis. He kept the fishes in 150 US gallon acrylic tank, 24”/60cm wide. Richard noted his female had brighter red colouration shown on the unpaired fins which were also larger, had a snow white belly. The female had more “personality” and was easy to hand feed since acquired at 3 inches in 1996. In contrast, the male had dull colouration and a black belly. Female was 38 inches long, male was 32 inches long. Females typically more active. Over 200 round copper coloured eggs were produced. They were ¼”/ 6mm around. Richard was prepared for a spawn; he had a sponge filter running in the tank which could go into a 30 gallon tank to siphon eggs in and he had a video camera at the ready. One morning he noticed all the round copper objects but was used to off white coloured eggs and did not do anything with them nor record them on video. On return from work all eggs were gone. Commercial breeding as food fish is practiced in South America, a spin off from which are the aforementioned imports of 'kittens'. Aquaculture has also given us hybrids of Red tails and Tiger Shovelnose (Pseudoplatystoma sp.) Also shown is the inappropriately named white red tail catfish (which is all white) and it is very uncommon indeed.